What if you, or a child you love, was ashamed to show his or her face due to a cleft lip or palate - a deformity that could be repaired, but you have no money to repair it? That's what Operation Smile is all about. Close To My Heart has supported Operation Smile for years. What is Operation Smile? It is a group of volunteer medical professionals who travel around the world to treat children suffering from facial deformities. Their efforts mean new smiles for thousands of children throughout the world. See a video clip about what Operation Smile does here. But you know what the best part is? A smile can be repaired in under an hour for only $240. My goal this month is to raise enough money to repair at least one smile! Just $240 -- Would you please help? Here is a CTMH special offer for the month of February that benefits Operation Smile. 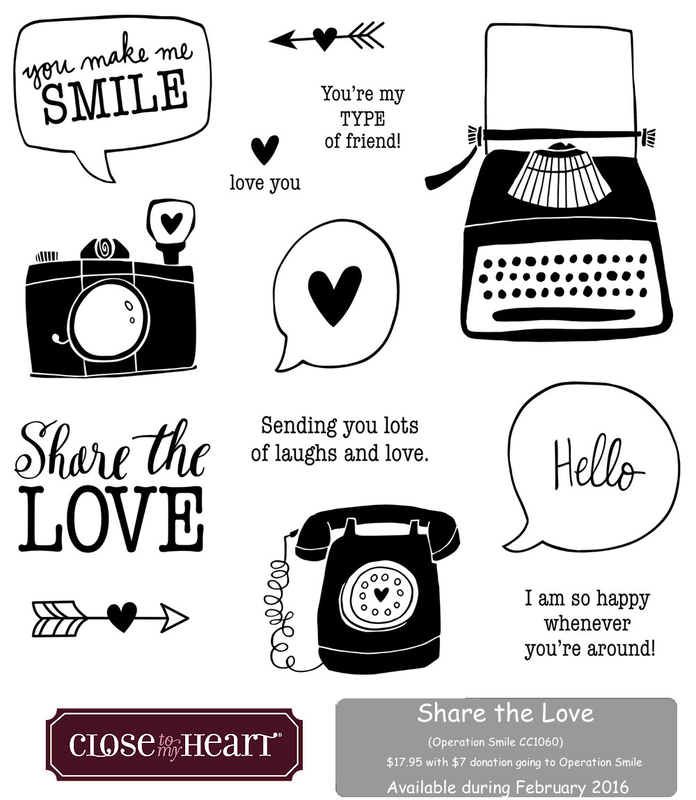 Share the love this February by purchasing the exclusive My Acrylix® Share the Love D-size stamp set (CC1060). This set is full of adorable icons and loveable sentiments, yet there is more to this stamp set than meets the eye! 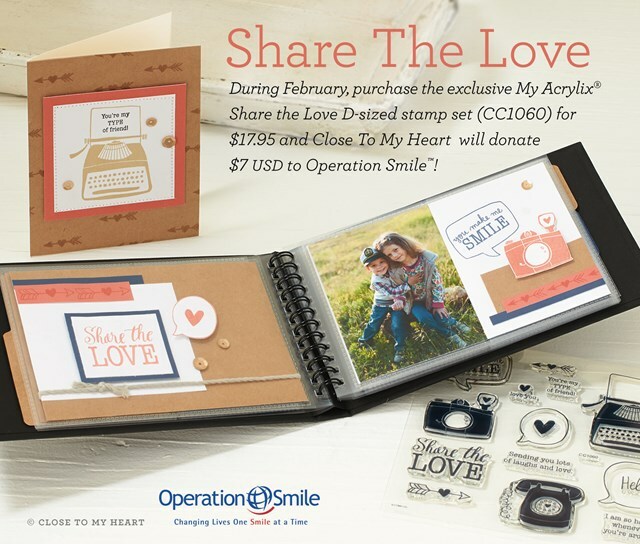 Not only will you be getting a high-quality stamp set by taking part in this promotion, but Close To My Heart will also donate $7 USD of the proceeds from this stamp set to Operation Smile™, an amazing organization that provides surgeries to repair cleft lips and palates for children all over the world! Here's a better look at the stamp set. As many of you already know, I host monthly crops to raise money for Operation Smile. So far this year my friends and I have donated $68.92. We're 1/4 of the way to our $240. If you're interested in just making a donation without a purchase, please let me know. You will receive some free greeting cards (made by me) for your donation. Other ways you could help with an Operation Smile Donation. 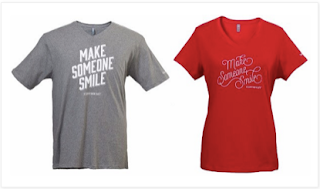 These T-shirts ($25) net another $10 donation to Operation Smile for each shirt sold. Operation Smile made by CTMH for each set purchased. 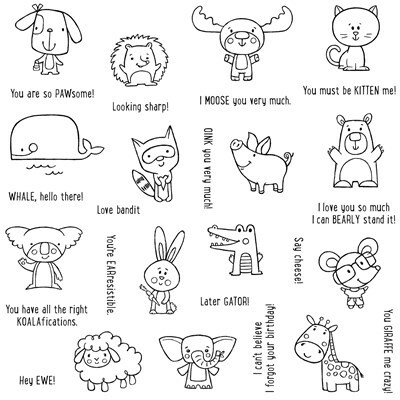 Set of 30 stamps - animals and sayings are each separate stamps. If you are coming from Jean's blog, you are on the right path. To join in the fun, start here. At the end of my blog entry you will find a link to the next blog. If you get lost along the way, you can find the complete list of consultants participating in this blog hop here. 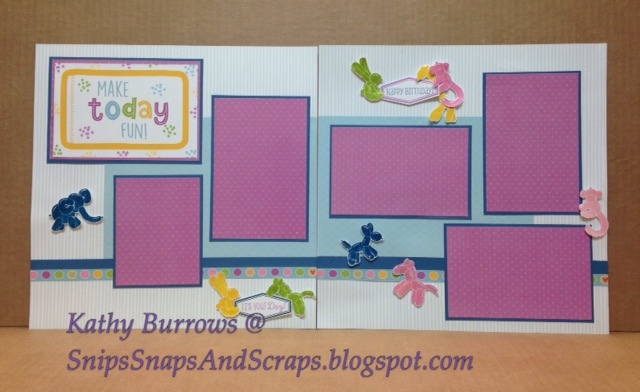 --- so much fun for creating cute cards or playful scrapbook layouts. a bunch of fun cards using this set. 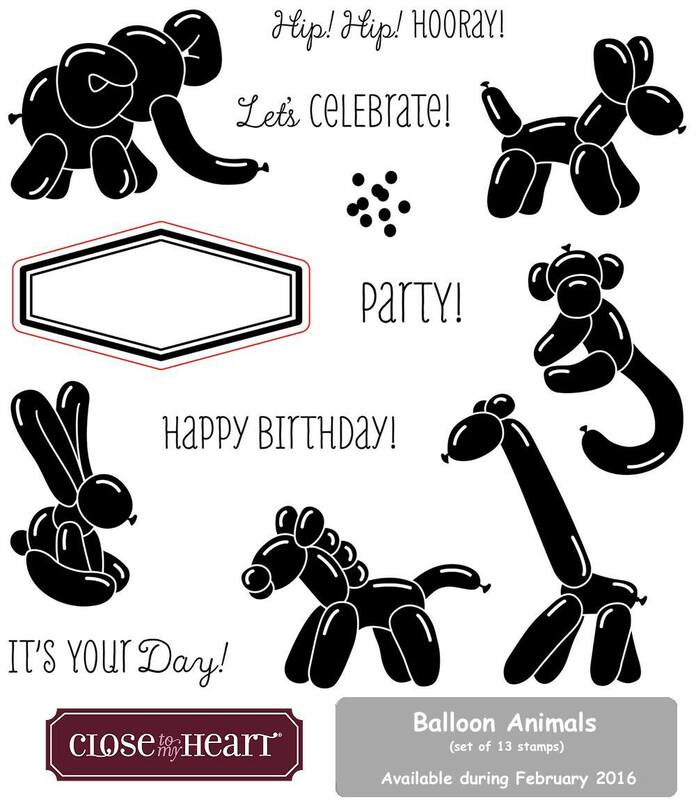 Still debating on whether or not to add strings to some of the balloons. Here's a close-up of the balloons coated with Liquid Glass to give a glossy look. to give the appearance of floating through the air. Supplies used: click on any of the links below to see these products. 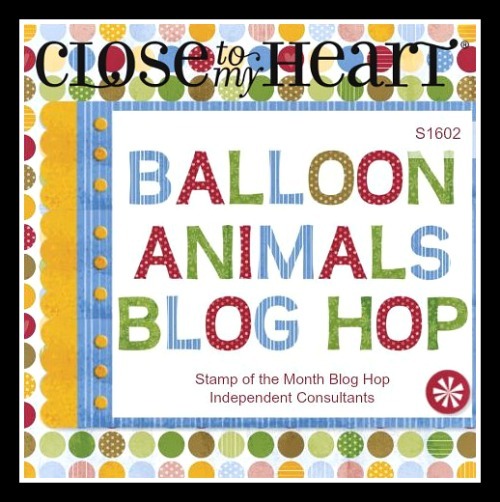 You can get this stamp set of or any of the supplies listed here from your Close to My Heart consultant or shop my website. 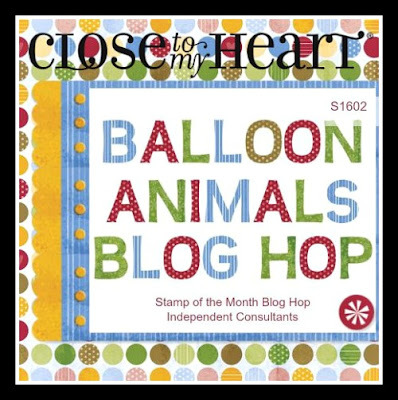 Remember, the stamp of the month is only available through the month of February. You can purchase alone for $17.95, or with an order of $50, you can get it for just $5. 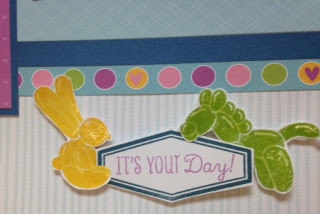 So on you go to the next fun idea using this stamp set at Jen's blog. Have your pinning finger ready, as I'm sure you're bound to find many ideas that you'll want to try when you get your own stamp set.